This Purchase Agreement is for a portfolio of single family homes leased to tenants. The agreement contemplates an all cash purchase of the single family homes by an investor purchaser who will step into the shoes of the seller as the landlord under the leases to the existing tenants. The purchase price is to be paid in all cash following the due diligence review and approval by the buyer. The seller is required to furnish due diligence materials to the buyer as itemized in the agreement. The agreement also contains a bill of sale and assignment for personal property including appliances contained in the single family homes conveyed with to the purchaser, a certificate of non foreign status (FIRPTA Affidavit) and a list of all service contracts for the property included as exhibits. THIS PURCHASE AND SALE AGREEMENT FOR SINGLE FAMILY HOMES (this "Agreement") is made as of __________, 20__ ("Effective Date"), by and between HOME HOLDINGS LLC, a __________ limited liability company ("Seller") and HOME BUYERS LLC, a __________ limited liability company (together with any designee identified or appointed by HOME BUYERS LLC, ("Buyer"). The following terms, as used in this Agreement, will have the meanings assigned to such terms in this Defined Terms Section of the Agreement, subject to any adjustments set forth elsewhere in this Agreement. Purchase Price: $___________ subject to adjustment in accordance with the provisions of this Agreement. Number of Single Family Homes included in the Property: _____. Closing Date: 30 days after expiration of the Approval Period. Due Diligence Period: Subject to the provisions of Section 7 below, the period commencing on the Effective Date and ending on the later to occur of (i) the date that is 30 days after the Effective Date, and (ii) the date that is 5 business days following the date on which Buyer has received a fully executed Lease (as defined herein) applicable to each of the ___ houses that comprise the Property (as defined herein), during which period Buyer will be provided the opportunity to review all aspects of the Property. B. Seller desires to sell, and Buyer desires to buy, the Property, at the price and on the terms and conditions hereafter set forth. 1. Premises. The real estate which is the subject of this Agreement consists of ___ single family homes, in the State of __________, which are identified and generally described on Exhibit A attached hereto, together with all of the improvements and structures located thereon ("Improvements"), any heating and ventilating systems and other fixtures located therein or thereon, and all rights, interests, benefits, privileges, easements and appurtenances to the land and the Improvements, if any (collectively, the "Premises"). 2. Personal Property and Leases. (a) The "Personal Property" referred to herein shall consist of all right, title, and interest of Seller, if any, in all tangible (including all advertising materials, plans and specifications) and intangible personal property, including any equipment, appliances, or furnishings that remain in the Premises at the Closing, and any and all existing licenses and permits held by Seller and not constituting part of the real estate, located on and used in connection with the Premises. 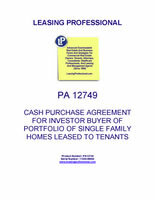 (b) The "Leases" referred to herein shall consist of the leases, occupancy and rental agreements between the Seller, as landlord and tenants of the single family homes that comprise the Premises that are in effect as of the date of the Closing (defined below), as well as and service contracts relating to the maintenance and repair of such homes. 3. Sale/Conveyance and Assignment. Seller agrees to sell, convey and assign to Buyer, and Buyer agrees to buy and assume from Seller, at the price and upon the other terms and conditions hereafter set forth (a) the Premises, (b) the Personal Property, (c) the Improvements, and (d) the Leases (a-d collectively, the "Property"). (a) Title to the Property shall be conveyed to Buyer by a Limited Warranty Deed, in the form customary in the State of __________ (the "Deed"), executed by Seller, in the form attached hereto as Exhibit C.
(b) The Personal Property shall be conveyed to Buyer by a bill of sale (the "Bill of Sale") executed by Seller, in the form attached hereto as Exhibit D.
(c) The Leases shall be assigned by Seller and assumed by Buyer by an Assignment Leases and Contracts (the "Assignment of Leases and Contracts"), in the form attached hereto as Exhibit E.
(1) Within two (2) business days after the execution of this Agreement, Buyer shall deposit into an escrow account (the "Escrow") established with Escrow Holder (as identified in the Defined Terms), which will serve as escrow holder for this transaction a deposit in the amount of the Deposit (as identified in the Defined Terms above). If Buyer notifies Seller that it elects to proceed to purchase the Property in accordance with the provisions of Section 7, then the Deposit (as defined in the Defined Terms) will become non-refundable to Buyer, except in the event of a default or breach of this Agreement by Seller. The Deposit shall at all times prior to Closing be invested in United States treasury obligations or such other interest bearing accounts or securities as are approved by Buyer in writing; all interest earned on the Deposit will be administered, paid or credited (as the case may be) in the same manner as the Deposit and, when credited to the escrow account shall constitute additional Deposit. At the closing of the transactions contemplated by this Agreement (the "Closing"), Buyer shall receive a credit against the Purchase Price for the Deposit. (2) The Purchase Price, less a credit for the Deposit, and plus or minus prorations and adjustments as set forth in Section 17 hereof, shall be paid by Buyer to Seller by wire transfer of immediately available federal funds on the Closing Date. (b) Appraised Value. Buyer may elect to retain an independent, third-party appraiser to prepare a valuation report or appraisal ("Appraisal") of the Property. Any person preparing the Appraisal on behalf of Buyer must be a licensed appraiser in the jurisdiction where the Property is located with at least five years experience appraising single family homes of the type and nature of the properties that comprise the Property. Upon request, Buyer shall provide Seller with copies of any Appraisals of the Property. If the sum of the appraised values of the properties that comprise the Property ("Total Appraised Value") is less than the Purchase Price, then within three (3) business days after receipt of the Appraisals, Buyer shall provide written notification to Seller that Buyer intends to reduce the Purchase Price by the amount that the Purchase Price exceeds the Total Appraised Value; provided that Buyer has no right to a Purchase Price reduction in excess of five percent (5%) of the original Purchase Price without Seller's written agreement. If the Purchase Price exceeds the Total Appraised Value by more than 5% of the Purchase Price, and Seller does not agree to reduce the Purchase Price to the Total Appraised Value, then Buyer may, upon written notice to Seller at least ten business days before the then-scheduled Closing Date, elect to (i) close the transaction as contemplated with a 5% reduction of the Purchase Price or (ii) terminate this Agreement. If Buyer terminates this Agreement in accordance with this Section 5(b), then this Agreement will have no further force or effect, the parties will have no further obligations to each other (except for any indemnities or other provisions that expressly survive termination of this Agreement) and Escrow Holder shall refund the Deposit to Buyer. (c) Notwithstanding Section 5(b) above and Section 7(d) below, Buyer may, in lieu of adjusting the Purchase Price as a result of necessary repairs and replacements or a Total Appraised Value that is less than the Purchase Price in accordance with those provisions, elect to exclude specified properties from the properties identified on Exhibit A. If, as a result of its due diligence investigations, Buyer elects to exclude one or more properties from the Property being acquired in accordance with this Agreement, then at least ten business days before the Closing Date, Buyer will notify Seller that certain specified properties ("Excluded Properties") are to be excluded from the sale contemplated in this Agreement. Seller shall have two business days to accept Buyer's Excluded Properties. Following Buyer's notification to Seller, Buyer's identification of the Excluded Properties and Seller's acceptance of the Excluded Properties, (i) the description of the properties that comprise the Property, as identified on Exhibit A, will be deemed modified to exclude the Excluded Properties; and (ii) the Purchase Price will be reduced by an amount equal to the aggregate total of the prices set forth for the Excluded Properties as identified on Exhibit A. Once Buyer identifies to Seller the Excluded Properties, those properties so identified will no longer be the subject of this Agreement and Seller will be free to sell them to another party or take any action that Seller elects with respect to the Excluded Properties.